This new worship project in West Jordan, Utah, began with community outreach, programming and master planning phases led by Sparano + Mooney Architecture to help determine the vision for the replacement of a 1960's church and rectory building. The program document developed by the architects included a new church with seating for 800, a modern parish rectory and a long-term master plan with improved site circulation and a revised parking layout. The new church architecture includes a sanctuary with sloping floors, fixed pews and a centralized altar and ambo, baptismal font at the entrance, reconciliation chapel and chapel of reservation. Other components of the award-winning design include a contemporary day chapel with reclaimed elements from the former church, a children's room, a hospitality room, parish offices and meeting rooms, and a large gathering space connecting to outdoor courtyard. 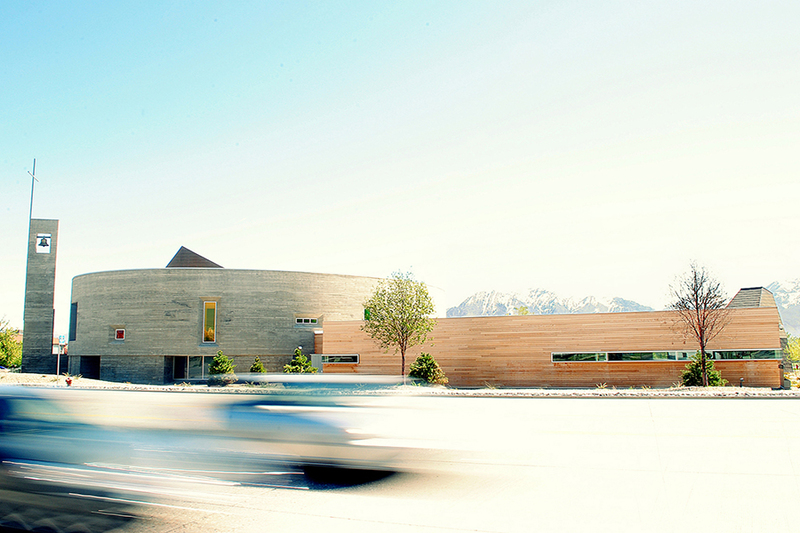 The church incorporates sustainable design elements throughout and is powered by the renewable energy of solar panels.